1-2 What Have I Done To Deserve This? 2-13 Do I Have To? 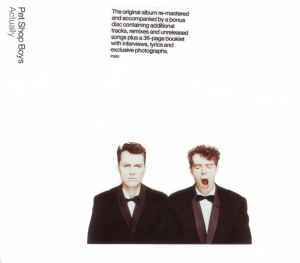 Licensed From – Pet Shop Boys Partnership Ltd.
Actually was recorded in London at Sarm West and Advision studios. Further Listening 1987–1988 was remastered at Metropolis Mastering, London. ℗ 2001 digitally remastered. The copyright in these sound recordings is owned By EMI Records Ltd. © 2001 EMI Records Ltd. Some copies (at least variant 3) with "MID-PRICE" sticker on front. Track 2-7 Heart (Disco Mix) is 10 seconds longer than the same version on the original Heart CD single. It's not a different version, it has been slowed down a bit resulting in a lower pitch and a longer duration. 1-6 Does not, as far as I know, contain any contribution from Mr Morricone.